Here is another post in my series on "I'll Eat it So You Don't Have to". The entry is yet another "new" breakfast cereal. I eat cereal during the week. It's faster to fix in the morning and now, because I have to take Prednisone which is best taken with milk, cereal in milk makes the morning go a bit smoother. On weekends, I can eat my oatmeal or have pancakes. As with the Life strawberry cereal purchase, I was governed by price. This stuff was on sale, cheap. It comes in two flavors, the chocolate with the chocolate middle that I purchased, and a wheat with a chocolate middle. Dump it into the bowl and it doesn't look that bad. 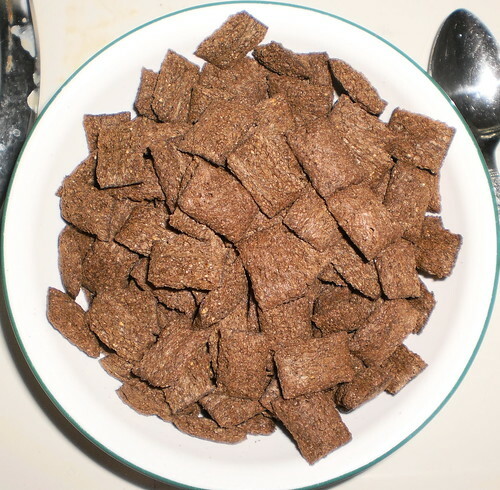 There is a resemblance to frosted mini-wheats or spoon-size shredded wheat. I added milk and that's when things became unimpressive. These little pillows of chocolate get soggy almost immediately upon being touched by milk. By the time I get to the last few spoonfuls, there is no crunch. It's just mush. I think the only thing holding them together, at that point is the chocolate stuff on the inside. There are probably people who like that, a soft cereal, but I don't. I want crunch. I won't be buying these again regardless of the price because they don't hold up to milk. They don't turn the milk a different flavor as the strawberry ones did, which is a plus. It means less sugar leeching into the milk. But I am not sold on these. Perhaps I just need to buy my Cheerios, regardless of the price. "New" isn't as exciting as it seems to be.